I know that not everyone is a fan of beans. My kids thought beans were gross until I made a batch of black bean brownies. Now, they ask me to make this to share with their classmates on their birthdays! One of my goals as a real foodie parent is to find a way to get my kids to like all the foods that are good for them. My first attempt at refried beans was a failure, but I’m hoping that this batch of crock pot refried beans will win them over for good. I say hoping, because I haven’t tested these out on my kids yet… YET. You see, I once bought a can of refried beans, put WAAAY too much on a burrito, sprinkled the teeniest amount of cheese and told my kids to eat it or else. They were in what I call the “easy to permanently scar” age (2-4 years old) and let’s just say that my ultimatum didn’t go over so well. The bean burritos went half-eaten, and the half that was eaten ended back up on their plates. Yep, but I learned a lot of lessons that day and have since taken a different approach to getting my kids to eat beans. First, hide them whenever possible. Remember the aforementioned black bean brownies? You can’t even tell they have beans in them, and I certainly didn’t say anything. When the kids ate seconds and thirds, I knew the recipe was a winner. That success led to white bean blondies (which are also loved). These led to chocolate hummus and cookie dough hummus – both of which are in our weekly lunchbox rotation. Second, I almost always make them from scratch. I’m not beyond having a can or two of beans in the pantry, because even foodie moms get busy and forget to soak beans or need to whip up dinner in a flash. But I have learned that cooking beans from scratch always, always, ALWAYS tastes better. 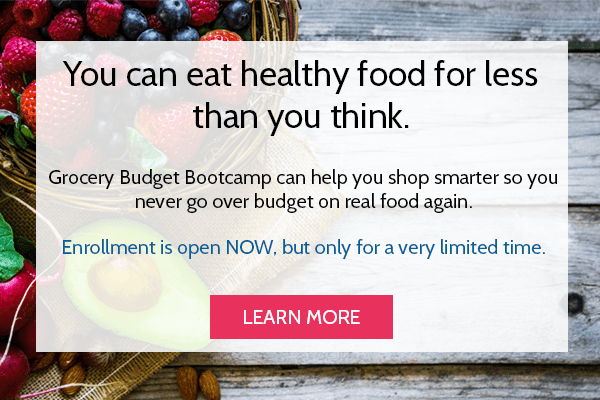 And when its worth my time (like I teach in Grocery Budget Bootcamp), it always saves me money. Speaking of from scratch, let’s talk about these crock pot refried beans. First, they’re not “re-fried.” SHOCKER! 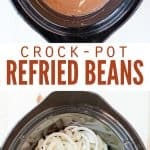 Although the term “refried” does technically mean to fry something (twice), these crock pot refried beans are only cooked once. Why? Well, mainly because it’s easier. Let’s face it – we’re all busy. And if I can cut a step out of a recipe without sacrificing the end result, I’m all about it. Also because the re-fry isn’t really necessary in this recipe. This batch of crock pot refried beans is PACKED with the classic, yet basic flavors of onions, garlic, jalapenos and cumin that we’ve all grown to love and expect out of Mexican cuisine. 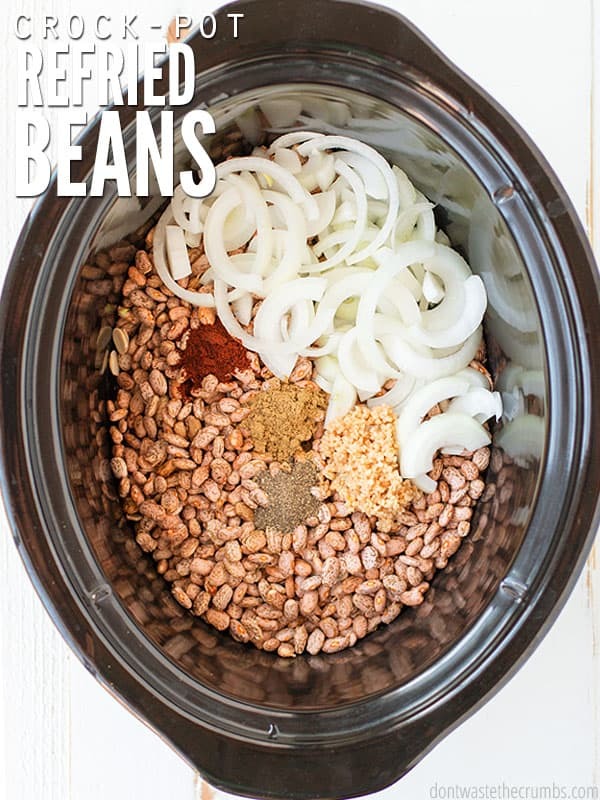 The fact that the beans cook ALL DAY LONG in the slow cooker means the flavors really get soaked up into every little ounce of bean. When the beans are done, you blend with an immersion blender (or with a spoon or whatever you have) until they’re the consistency you like. Whether you want chunky beans or perfectly smooth beans is up to you. The end result is a batch of crock pot refried beans (without the re-fry), and no one even notices the difference. 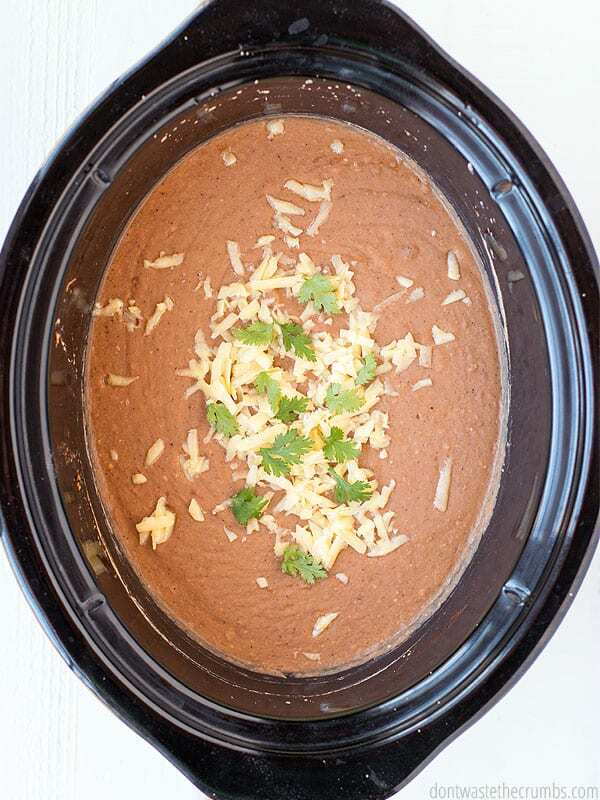 The recipe for crock pot refried beans is flexible, depending on your personal preferences and what you have on hand. Substitute chicken stock for up to half of the water in the recipe. I wouldn’t go anymore than that though, otherwise you’ll lose the bean flavor. We make homemade chicken stock in the slow cooker, so plan in advance if you only have one slow cooker. (I have this 6 quart slow cooker, but I’m tempted to invest in an instant pot too!). Substitute a 4 oz can of diced green chilies in lieu of the jalapeno. You can do ½ cup of chili verde salsa too, although between the two, I liked the green chili option better. You can also keep the jalapeno for flavor, but remove the membranes and seeds first. Keeping the membranes and seeds of the jalapeno will definitely make it hotter. You can also add a second pepper, or choose a hotter pepper altogether. As a general rule of thumb, the more wrinkly the jalapeno, the hotter it is. Like “refried” black beans? 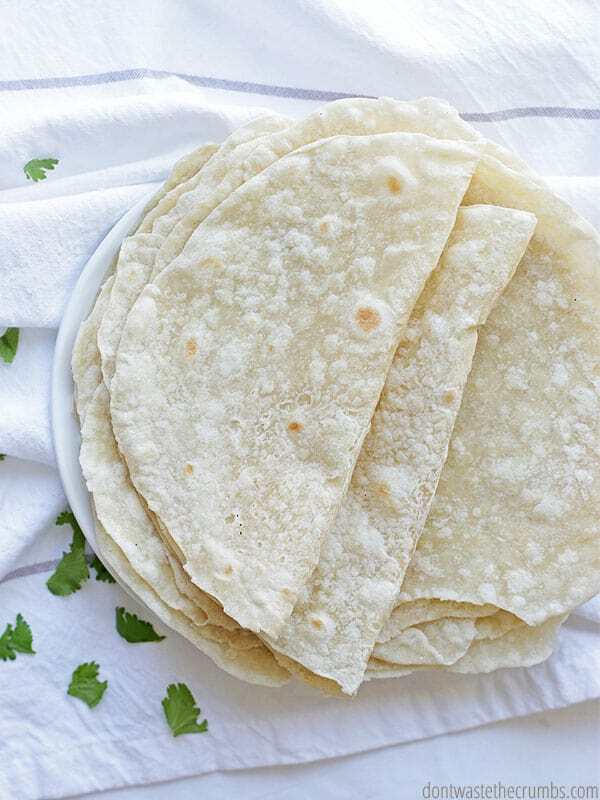 Swap them for the pinto beans and you have an entirely new, yet delicious, recipe. I’ve made this recipe with beans soaked overnight (to reduce the gaseous aftermath) and with freshly rinsed dry beans. You can’t go wrong either way, so do whatever you prefer. 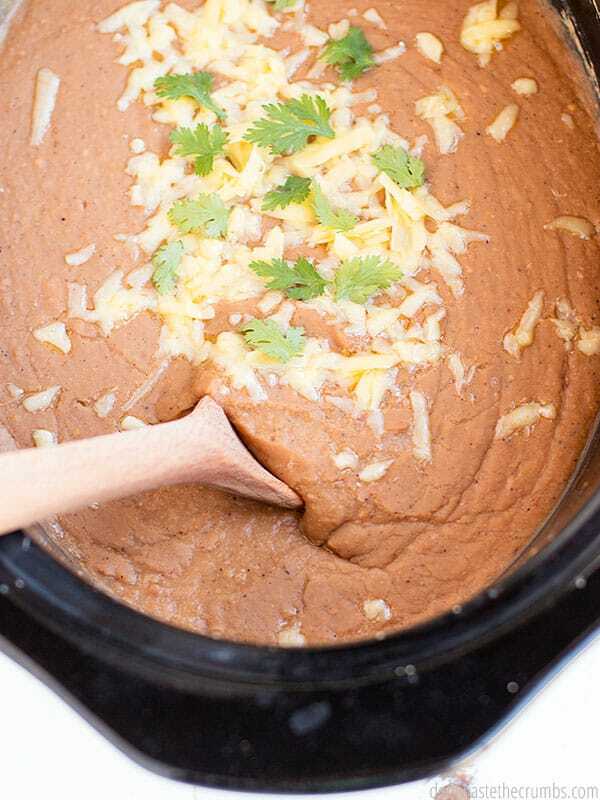 This crock pot refried beans recipe makes a big batch, but they freeze BEAUTIFULLY. Depending on your needs, you have a couple options here. Line a muffin tin with silicone muffin liners. I have this muffin tin and these silicone liners and LOVE them both. Measure ¼ cup of cooked refried beans (or save your sanity and use this muffin/ice cream scoop – totally worth every penny!) into each muffin liner. Freeze the whole pan for about 8 hours, or overnight. Remove each portion from the silicone liner and store in a freezer-safe container, in the freezer. Pull out what you, when you want them, and reheat on the stove or microwave. Re-use plastic containers that once held sour cream, yogurt or cream cheese. Smaller, 8 ounce containers are perfect for 2-3 people, and larger 16 ounce containers are great for 4-6 people. You can store the beans in these containers, with a lid in the freezer, OR you can remove the frozen beans to another freezer-safe container if you need to re-use the plastic one. There is always the option of freezing in glass too, and this tutorial on how to freeze in glass without breaking the jar is super helpful! Note: Freezing food after making big batches is a great way to save money on groceries AND have pre-cooked healthy options to eat later. 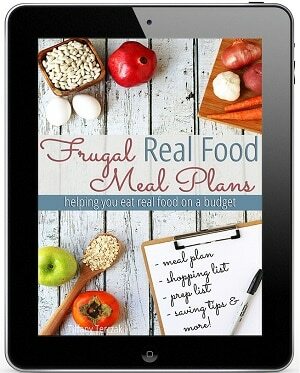 I love having a meal plan for freezer cooking, and even a pre-made grocery list to cut down on time and effort! Check out the Freezer Family Bundle here for awesome prepped meal plans for your family. 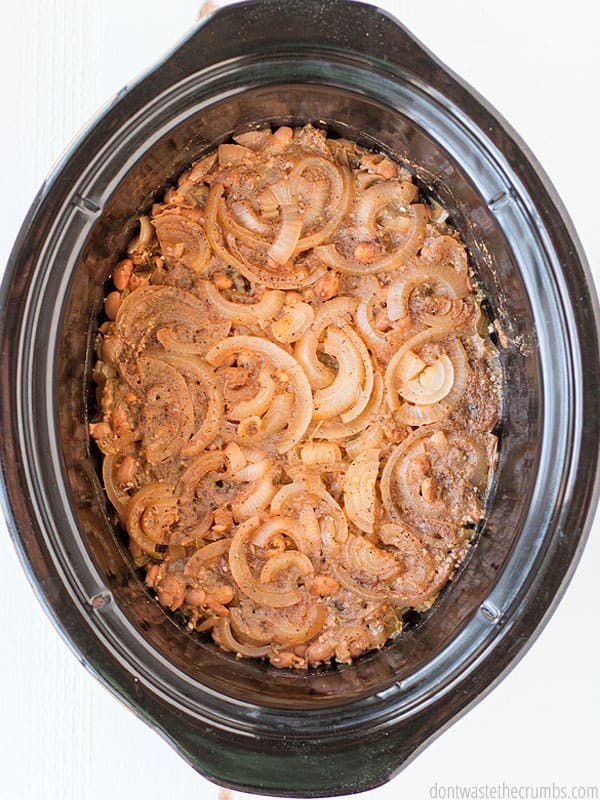 However you like crock pot refried beans, I hope you enjoy! Crockpot Refried Beans for the win! 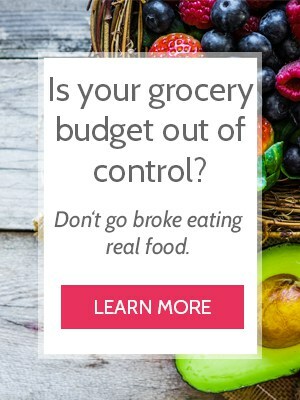 Beans are super frugal and make it on our meal plans quite frequently. For this recipe I use this crock pot and this immersion blender. I also learned how to convert this recipe to my Instant Pot for when I forget to start the beans early! Refried beans are perfect for cooking once and eating twice. They store great in the freezer! Use old yogurt containers, one of these types of containers, or even glass jars. Place all the ingredients in a large slow cooker. I have this 6 quart slow cooker, but I wouldn't use anything smaller than a 4 quart. Cook on high for 8 hours if using dry or soaked beans. Cook on high for 4 hours if using canned beans. Place a colander over a stock pot and drain as much water as you can from the beans. Using an immersion blender (or potato masher, or alternating in a blender), mash the beans until they reach your desired consistency, using some of the cooking water to help thin. Remember that you can always add more water to thin, but you cannot make them thicker again. Serve hot, or prepare for storage. Where on the spectrum does your family fall with beans? Love them, or hate them? Share your experiences in the comment section below! Great post. I love pinto beans and your recipe is spot on. Other benefits are high fiber and protein source. We made crock pot “refried” beans for the first time in May. They were a hit and we loved them! So much better than the can stuff. Looking forward to making this. In regards to using canned beans instead of dry beans, you mentioned using 3 cans. Are we talking the 14/15 oz. cans, or something larger? Thank you so much! Hi there. I came across this recipe and want to try it tonight. I have left over pinto beans that I have already cooked. What would the water ratio be for this? Hi Natalie! If all the beans are cooked, reduce the water by half and check the levels throughout the day to make sure they’re not too low. If you’re not going to be home, reduce by one-fourth. So, it’s a really newbie cooking mistake, but if you put this recipe together at night, don’t trust your sleepy brain to actually remember the steps in the morning. Step 3 is kind of important. 😛 Smells amazing though! LOL!! So you have soupy beans? You can fix it Rebecca, if you have cooked pinto beans to mix in. I haven’t done that, so it might take some back and forth to get the consistency right. Definitely do that when you’re awake! I have another pound of dried beans, but I think I’m going to run by the store for some canned beans. Otherwise, it’s a good base for refried bean soup, LOL! 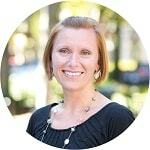 Hi Rebecca, My husband made the same mistake and I was so upset .We ended up thickening it it with cornstarch! Turned out perfect! We love this recipe! So your saying after you let the beans soak overnight make sure you drain them but remember to save some liquid correct? I will be trying this recipe for Easter this year, so this really needs to come out great! And another question how many lbs. of dry beans if I’m making this for 40 people. The picture of the ingredients in the crockpot show a red spice as well. Is that Paprika because its not in the recipe? That’s a good question! I’ll check with Tiffany and we’ll get back to you. It could be chili powder too. I’ll find out! I reserve the liquid and use for consistency after mashing or blending. And if you add just a bit of bacon grease after mashing…oh my gosh. Ooo Bacon grease! That sounds delicious! You can definitely thicken refried beans by simmering them on the stove for a bit. Just an FYI in case anyone accidentally puts too much water in them. Never tried thickening them in a crock pot though. I have found even zapping them in the microwave for 2 minutes at a time changes its thickness. That’s a great tip Abby – thanks so much for sharing! Ooh! I have a pound of beans I’ve been dying to cook. Can’t wait to try this. I have to ask, please don’t laugh, but you mentioned soaking them reduces the gaseous aftermath. Cooking them dry vs soaking changes this how? I had no idea about this. I’ll soak for sure. LOL! Your recipe offers options to cook dry, soaked, or canned, but I saw others that said you MUST soak first. This recipe sounds so delicious! I’ll be soaking and cooking tonight! Hi Jennifer – gas is no laughing matter! Soaking first helps to reduce the enzymes that cause our digestive system to create gas (as a side effect to breaking down the beans). If there’s less enzymes, there’s less gas! You definitely don’t HAVE to soak first. I’ve tested this recipe both soaking and not soaked and it doesn’t make a difference in the end other than one causes a few more toots! A little on whether to soak or not, I would say that soaking in fact is mandatory when it comes to beans and legumes. Not only does it reduce flatulence, but cuts cooking time to a fraction. Fuel is money, so frugal cooking needs to save fuel as well. In the Indian subcontinent, legumes are soaked overnight, or 8 hours minimum, rinsed and pressure cooked. Pressure cooking further hastens the process and saves fuel. Agree, by soaking you reduce the anti nutrient enzymes too. Made these with and without the jalepeno and used 5-6 whole garlic cloves each time….this is the perfect recipe. I’m so glad I found it. Thank you!! You’re very welcome Gaylin! I’m so glad you liked it!! Do you mash up all the onions with the beans or do you taken them out? Can you double this recipe is the same crock pot? I am trying to feed a large group. I do have a normal size crock pot and a over sized crock pot. You can double the recipe for sure Jodi, but I’d use a crock pot that’s 7 quarts or larger. You MIGHT get away with a 6 quart, but I’m not entire sure! Delicious! I will never eat canned beans again! So glad you liked the recipe Kristi! I made these! These beans turned out great. I followed the recipe and blended them in batches. I didn’t want them totally puréed so I pulsed them a few times. I only. Me see a few very small pieces of the onion. They needed a lot of salt I did not add salt until the end of cooking because I’ve heard salt seizes up the beans. I cooked on low from 8-1 and then on high from 1-2:30 and they were done. Hey are so tasty! I’m so glad you liked them Angie! Thanks Tiffany! I followed your directions on how to soak beans & I think I got myself confused going from that post to the actual recipe. Anyway, as I mentioned before,this was my first try at refried beans & I am excited to have found this recipe because I am quite happy with the results I had today! I was actually wondering how they turned out in the instant pot? Could you tell me what settings and cook times you used? My mom and I can’t wait to try these when I visit her next week! Thanks! They turned out great!! “beans” setting for 45 min, follow the rest of the recipe as usual!! Enjoy!! Ok just to make sure I’m understanding this, I️ will blend even the onions with the beans? Made this for a school function. Trying to make something a bit more homemade than opening up cans and doctoring them with onions and spices. Turns out I’m either really good at doctoring tinned beans or something about this recipe isn’t working for me. Could be my beans were an off brand. As far as I would say, fresh pepper, garlic and Oregano and extra virgin olive oil seemed to help. I didn’t use animal products because I was doing vegetarian entree. Still, Meh. Wow – you made this as written Elle (except veggie stock for chicken stock?) and you thought it was bland? You must be good at doctoring, because every time I make this, my taste buds are always blown away! I didn’t particularly care for the recipe either. A) I think one of the spices turned me off. B) I added more liquid than called for and mine were sill so thick it was horrific. Paste isn’t as thick as mine turned out. I’ll try again, in the crock pot, and hope for a better turnout. Jennifer – I can’t speak for which of the spices that turned you off, but you can add more water to thin your blended beans so they’re the texture you desire. Step 4 specifically states this. I didn’t have a problem with mine being too pasty, though I agree (as did my kids!) that the spices were off. As written, there was way too much of a pepper flavor, which overpowered the other flavors. When I attempted this a second time, I used 2 tsp of cumin and only 1/2 tsp of pepper, and added a heaping tablespoon of vegetable bouillon (since I didn’t have any chicken) for some extra flavor. They were so much better and more of how I imagined they should taste. I’ve had to add extra water to mine if it dried out too much. And I can understand if the flavor wasn’t just right. Every family is a bit different! Hey! Can you tell me what the best way to store these would be? I am making them for Christmas and would like to do it ahead of time. Should I freeze them or just hold in the refrigerator for a few days? And then I can reheat in the crockpot, I’m hoping? Hi Rebecca! The best way to store for longer than a few days (i.e. making now for Christmas) would be to freeze. I’d recommend following the recipe and blending to your desired consistency. Then freeze in old yogurt containers (or whatever really). Thaw the night before in the fridge and then you can reheat in the crock pot OR the stove top. I wouldn’t put frozen beans in the crockpot though, as it would increase the chances of burning with such a small surface area touching the slow cooker. Just made these beans and they’re definitely going on my regular recipe rotation!! Question- is there a good way to use the extra bean cooking liquid? I hate to waste things! So glad you liked them Sarah!! What if you used the bean liquid in soup? Or chili? Outstanding!! These are absolutely the most amazing refried beans ever!! Thank you so much! Just follow the recipe to perfection! WOW! Thanks so much for the glowing review Rick! This is an excellent recipe! I made this tonight. The family loved it! I’m so glad you guys liked it Sarah! Is it really 8 hours on high weather there dried or soaked? I feel like soaked beans would need less time. Yes ma’am!! For this recipe, it’s not so much until the beans are “done,” rather you want them to absorb as much of the flavorful cooking liquid as possible! This recipe is so wonderful! I add a tablespoon of bacon fat to it and it becomes heaven. 🙂 thank you for the recipe!! Delicious recipe! I use over and over! Thank you for sharing this recipe. My family devoured it. Will definitely save this one. So remove the onion or leave in when mashing? So do you have any idea just how many slow cooker refried bean recipes there are out there in internet-land? Zillions. And of those zillions, approximately 99.8% of them have all these crazy, and totally unnecessary, ingredients. I must admit, I thought you were crazy with 2T of minced garlic, but hey – it’s hard to ever have too much garlic, so I trusted you. I used a pretty big jalapeno but cut out the seeds and membranes. I also used all water (cheaper and easier – I’m on board). Got home from work…drained and immersioned the bean and other ingredients, toasted two corn tortillas with a bit of cheese on each, and topped with generous portions of these beans and HOLY COW!! These are awesome! Much better than anything store-bought, and in fact rivaling restaurant quality. Definitely a keeper recipe! PS – I LOVE the freezing ideas too!! I am a Yankee living in the south, love all thing southern, but do not like pinto beans, oh shame, anyways when hubs told me refied beans are made from pinto beans I had to go to our little country store where they are in a big barrel. Found your recipe and have been making ever since, followed your directions exactly, oh happy day, will never use any other recipe, these are the best, thankyou so very much for sharing! Hey Jess! I usually toss the liquid because I use water, but you can certainly keep it for soup!! I’m so glad you liked this recipe! First off, I love your recipes! I just finished the 2nd part of soaking – meaning just about boiled, then turned off and put on a lid (for 2 1/2 hours). Using this method, do I still cook in crockpot for 8 hours? So I just put this together in my crock pot and I’m wondering…do I blend the jalapeno up in the beans in that last step? Or remove it? My husband, my boy’s and I just love this recipe. Way better then store bought. I used the 3 cans of pinto beans method and ended up with bean soup. 9 cups is too much liquid if the beans are already cooked. 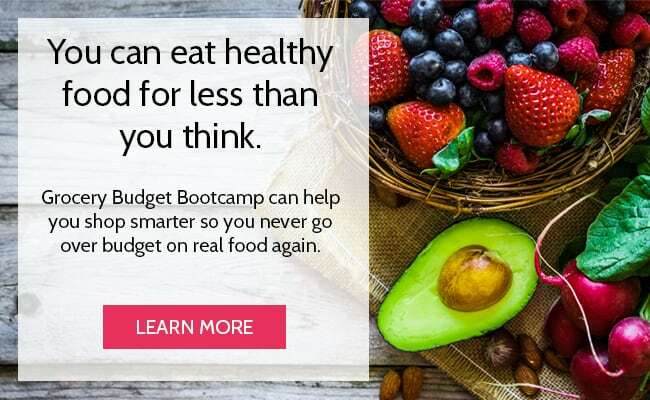 Angela – one pound of dry beans is equal to 6-7 cans of beans, so you should have doubled your beans. You can reduce the liquid if you’d like, but then you might risk burning the beans. Since you drain the liquid at the end anyway, it’s better to start with too much liquid than too little. The recipe says to use 1 lb dry beans or 3 cans cooked beans. Should it say 6 cans cooked beans instead? I made these according to the recipe with 3 cans and 9 cups of liquid and I agree that it was a lot of extra liquid to discard, but the flavors seemed right. If I doubled the beans, that would effectively halve the spices/onion/pepper which doesn’t seem right either. But maybe a lot of those are getting tossed out with the water, and more beans would more effectively soak them up? I’m going to test out the recipe as written but with half the water and see how it goes =) My family loved them the last time I made them! Thanks for the recipe. You are correct Natalie! And I’m so sorry for the error! I’m updating the recipe right now. Glad you guys like the flavor! Thank you for sharing this recipe! My kids usually don’t care for beans, but this recipe they love, I used black beans and divided the 9 cups of liquid between water and chicken stock, it turned out great will definitely use more in the future. Yay!! So glad you liked this Karren! 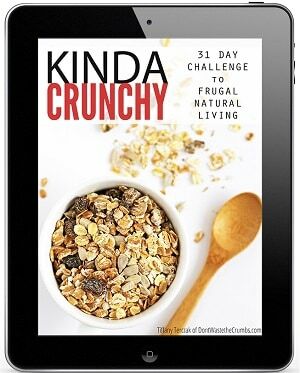 Have you converted this recipe for the Instant Pot? Not officially, but a lot of readers have done it successfully. I’d cook for 45 min in the IP! I made these for the first time on Easter this year. I have made them two more times since then, and we’re having them again tomorrow. This recipe is perfect! You have something red in the picture but it is not mentioned in the recipe. Is it chipotle, chili powder, paprika? I have made these and absolutely love them!! (without the red whatever) I use Pueblo hot chilies, but have to use them sparingly or it gets too hot to eat! That’s paprika Marian, but I didn’t include it in the actual recipe because I liked them better without it. 🙂 So glad you like this recipe!! Is soaking & rinsing enough to de-gass the beans? To de-gas dry bean, yes! Just follow the soaking method I have linked in the recipe. I’m planning to make this for a church luncheon on Sunday- can I make it on Saturday then reheat in crockpot sunday morning? Or should I set my alarm for 4am (eek early!) to have it ready by noon? thank you!! Definitely re-heat. Save some cooking water so you can thin as needed b/c the beans will get thicker as they stand. Enjoy! Thank you so much for such a quick reply! You saved me much needed sleep with a 12 week old! Can’t wait to try this! I was recently given your recipe as I have gone plant based eating and I am now venturing out on trying to make things more healthy homemade rather then store bought. These are amazing and easy….thanks! We’re not very adventurous when it comes to beans, but any white bean would be my second choice. We use garbanzo in dessert hummus, white in a few baked goods and black often as well. These were amazing! Don’t think I need to try any other recipe. Served them to guests as burritos in a flour tortilla with lettuce, salsa, sour cream, jalapenos, onions and cheese. Everyone loved them! Thanks for the recipe. Have frozen the leftovers in burrito sized portions for later. YAY! I’m so glad you liked this recipe Anne. Your burritos sound delicious!! I just got done making a double batch and I find them amazing. I used a large jalapeno with the seeds and membrane removed and I used only 2tsp of pepper. I cooked them on high for 4 hours and then low for 2 hours (my crockpot cooks hot or quickly, not sure). I did not pre-soak my beans but they still turned out wonderful and I will definately be making these again! I am wondering if anyone has ever saved the juice from their beans to help season the next batch. I will try it and try to update if is works well or not. I am thinking if it is a good batch of beans (to me that means the jalapeno didn’t have any extra hidden spice to it. LOL) then to use the juice would be a good benefit to spicing it for next time…maybe; maybe not but worth a try. I am cooking a pot right now. I made some variations due to my cupboards and tastes (dislike cumin). As this is essentially the same ingredients I use to “Doctor” canned beans when in a pinch, I am excited to see how slow cooking them will be. Once they have been cooking for an hour, I’ll add salt to taste. Now for the long wait! I hope the slow cooking infuses the flavors like they do for the recipe as written Kitty. You have some delicious sounding subs going on there!